Last month my sister, Lisa, wowed us with this really awesome veggie burger from a cookbook she originally rented from the library. She loved the book so much she bought it and I have to say each recipe we have tried thus far has been quite delicious. The cookbook is entitled, Burgers Every Way by Emily Haft Bloom and it showcases 100 recipes using beef, chicken, turkey, lamb, fish and vegetables. The Portobello Mushroom Burger was so delicious and extremely filling. If you’d like to try this recipe as well click here or below and purchase your own copy of the cookbook. Or rent it from your local library and be sure to come back here and share your thoughts. I wanted to share this really awesome recipe that was sent to me by lovely little sister. She found this recipe on tablefortwoblog.com and I must say it was very delicious. The recipe suggests cooking the dish in a crockpot but I’d forgotten about this step and started the process a little late. I ended up cooking the dish on the stovetop but was very pleased with the end results. The chicken was very tender and the flavor was simply delicious. My family loved it and we actually had it for dinner twice within this last week. 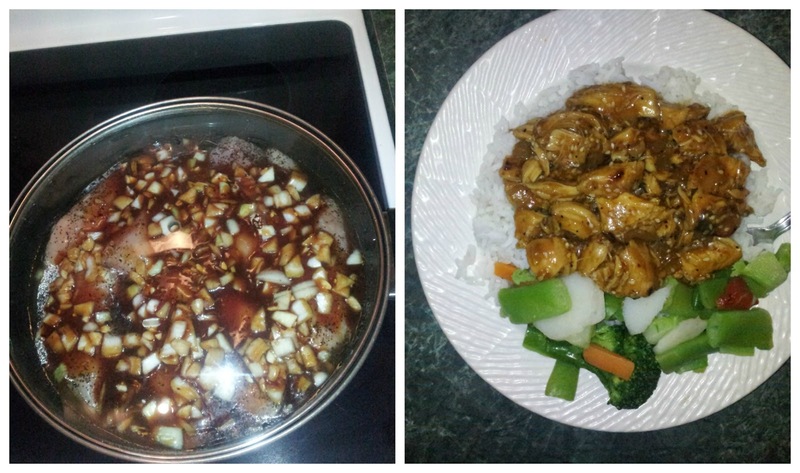 I paired my Bourbon chicken with white rice and stir-fry veggies. If you want a healthier alternative, swap the white rice for brown rice. I encourage you to try this recipe this week and come back here and tell me what you think. I’m sure you’ll enjoy it as much I did and don’t forget to tell the folks over at tablefortwoblog.com Napturale Living sent you over.